McGill's Repair and Construction, LLC | Page 10 of 7 | Servicing Southern Iowa's Electrical, Heating and Cooling needs since 1990. Upgrade your home or office outlets with the new USB Charging Outlets from Leviton. The 2-port combination outlet allows for charging of up to two devices and use of the 120 volt outlet. Available in standard colors and fits decorator type covers. Leviton’s USB Charger Devices feature a smart chip that recognizes and optimizes the charging power of your electronic devices for fast and efficient charging. Strategically placed vertical USB Ports in all models provide generous room to insert and maneuver charging cords and add to the contemporary and aesthetically appealing design. Plus, adapter-free charging eliminates unsightly clutter contributing to a neat appearance on countertops, desktops or wherever you choose to charge. Engineered for compatibility with the latest technology, Leviton USB Charger Devices are designed to charge tablets, smart and mobile phones, gaming devices, e-readers, digital cameras and a host of other electronic devices. Also available is the 4-port USB charger. Read more about them in Leviton Product Brochure. Contact David or James for more information on installation of these outlets. Hidden danger – Electrical wiring behind drywall. Stop right there! Check before you drill holes, pound a nail, or drive a screw into the wall. What you can’t see, can hurt you. Sometimes when adding electricity in older houses, or during remodeling, electrical wiring (and sometimes plumbing) is improperly installed just beneath the surface of the wallboard. This is a potentially dangerous situation due to the risk of hitting the wires or pipes while hanging a picture or shelf. 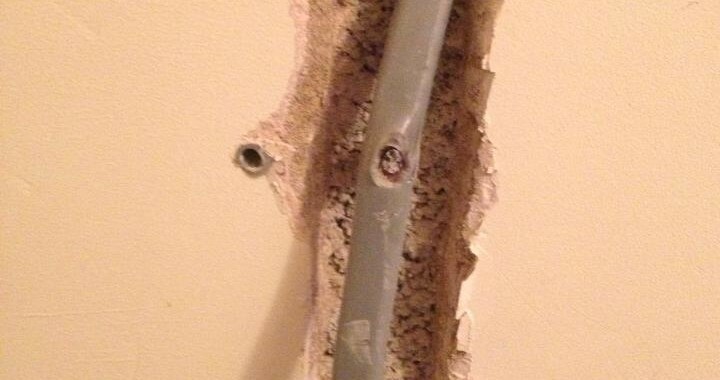 In the above photo, this unlucky homeowner found a wire for an outlet when installing a shelf on the wall. This is the reason why wiring is suppose to be located along the center of the vertical studs or center of wall cavity. It’s important to allow for some distance between the face of the wall and the wire. If you are not sure what’s hiding behind your walls, check with a live wire detector, such as the Zircon MultiScanner, before picking up that hammer or drill. Or call us and we’ll be happy to stop by and take a look.